Day 2 of Trans-Cascadia stretched over 18.1 miles of riding for Stages 6-11. The course sent racers backwards on the first three stages of Day 1 around Lake Timpanogas, which included some surprises; like a straight line down the scree field they hiked up yesterday. It may be the same trails but in reverse it has a different attitude, according to Lars Sternberg who raced in 2015 and is now back as a crewmember. The logistically heavy day made for an early morning – and a fairly quiet camp last night, despite the abundance of Steigl on tap and readily available bottles of wine from Clif Family Winery. Racers rolled out of camp starting at 8am, many shivering in the brisk fall air. At the start line, Trans-Cascadia veteran, Mark Weir was looking forward to today’s stages, “I don’t expect too much, I expect to have a good time and to try not to slap. And maybe make a couple positions up if I can, because today is more gravity fed. And I want to have fun and get to the bar at the end!” Mark arrived this year with much less prominent facial hair than last, but he was quick to explain that the shave was due to split ends, and not for aerodynamic purposes. By the end of Stage 10, Whitney Anderson, who’d had the lead in the Amateur Women’s field after Day 1, had firsthand knowledge of the change in terrain. She described the stage as having lots of pedalling, lots of drifting through loose stuff, some rocks, and a few stream crossings. “Today I was pushing a little too hard because I thought Amanda was hot on my heels and I took myself out – I slid out in a corner in a loose clear cut. 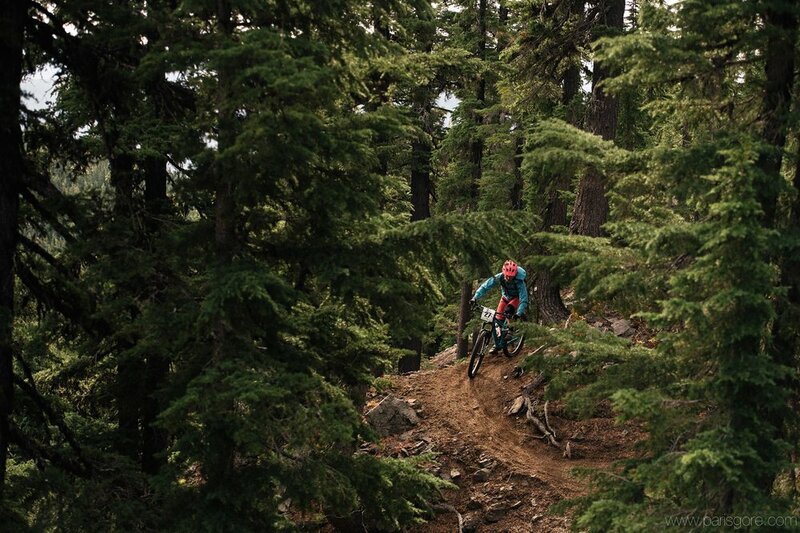 I definitely had to take a deep breath and take it down a notch.” Whitney also discussed the challenges with this specific format of blind enduro racing, “I had no idea where I was yesterday. When you’re racing with a bunch of people you don’t know, on trails you don’t know, you have no idea where you are in the mix. It was a complete unknown. And the stages I felt worst on, were my best stages. You have to push yourself but be able to reign it in at the same time. If you’re going way too hard that’s when mistakes happen, but if you slow down too much you’re no longer racing. It’s the fine line of pushing yourself and backing off just a little bit.” She finished in third place today, behind Corey Schmid in 2nd place, and Amanda Schaper in 1st. The evolution, or devolution, of the dirt today didn’t have any impact on Rosara Joseph’s winning streak. Tonight she was awarded her seventh straight leader jersey – and it should be noted that there have only been seven to win since Trans-Cascadia’s inception. In 2nd place in the Pro Women’s category is Kathy Pruitt, followed by Meggie Bichard in 3rd. Tomorrow stage is completely new to all racers, even those who raced last year. Basecamp is buzzing with speculation and anticipation, and Chris and Geoff are both looking forward to continuing their battle for the top step on some fresh – even never before ridden – trails.